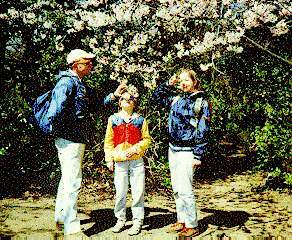 Since we arrived in two batches last September (myself only) and October (Marta, and daughters Dita - 14, Eva - 12 and Zuzana - 8), we have experienced more or less three phases in our relation to Japan. For most people of European background, Japan has always had the reputation of a faraway exotic place. Japan's attractiveness has especially increased with her recent successes in the field of modern technology. Thus when the opportunity appeared to live and work for some time in Japan, we did not hesitate too much. The beginning of our stay was marked mostly by the enthusiasm of a new experience, admiration of the achievements of the hard-working Japanese people and of all the high technology marvels they produce. But soon disappointment started to creep in, too, especially after the arrival of my family. Before we came to Japan, we had heard a lot about the famous Japanese gardens, ikebana and other traditional fine arts, and the Japanese love of nature. thus we have expected that in Japan the achievements of modern technology, modern structures and industrial facilities will be designed and integrated into the original environment in a much better way than in other countries, somehow in the spirit of the old Buddhist thinking stressing the attainment of man's harmony with nature. Well, we have found that the gardens or ikebana deserve well their fame. But we were disappointed because especially Tokyo as a whole is far from resembling a big harmonious garden. On the contrary, it seemed to us that the adverse effects of modern technology on the environment are in Tokyo even more pronounced than in other big cities of the world, though we are aware that this might simply be due to the large concentration of people in this area. Although the many shrines and temples with their surrounding gardens are still oases of peace and tranquility even in Tokyo, they are surrounded by what seemed to us a hostile environment dominated mainly by roaring and smelling trucks and cars, dangerous and obnoxious to pedestrians and bicyclists with with they often mix quite freely. And we were surprised that the people did not seem to care much about the pollution, at least as far as one can judge from the fact that most drivers never switch off the engines of their vehicles when stopping for longer that a few minutes. Often one can see a car with engine running, parked for half an hour or even longer. Perhaps when everybody will find an opportunity to have a look, for example from the Hinodejama in the Okutama mountains, on the thick layer of smog laying above Tokyo during windless periods (see figure: my daughters on top of the Hinodejama mountain facing the layer of smog over Tokyo), people might start changing their habits. I must admit that coming from the open spaces of western Canada, we do not like big cities too much. According to an Atlas of Japan we consulted in Canada before our departure, it seemed as if Wako-shi is somewhere in the countryside, relatively far from Tokyo. Thus we were surprised to find out that nowadays it is continuously joined with Tokyo. It is true that the RIKEN campus represents in the Greater Tokyo area a green and relatively peaceful oasis. But even here the peace is marred by an in Tokyo omnipresent high level of noise, originating in this case mostly from the nearby express highway. Thus the second phase of our stay in Japan was marked by near desperation when all the adverse effects of the life in Tokyo fell fully on us. Besides the unbearably high level of noise, the next biggest problem for us was the necessity to cope with the lack of space everywhere, to which the Japanese are becoming accustomed from childhood, but which might be in the beginning quite a problem for outsiders. In this respect we were helped very much by the RIKEN International Cooperation Office which found a quite spacious apartment for us not far from the RIKEN campus. To say the truth, we were warned by the director of this very office before coming to Japan that we might experience more problems when settling in Japan with children than we were likely to foresee then. His words proved to be quite true. But then we enjoyed the wonderful Japanese autumn with a lot of sunny weather and tasty mikan, and appreciated that this pleasant period extended well into the beginning of January. We went for hikes to the Okutama mountains nearly every second weekend (although the air was very clear there, it often was difficult to escape the noise even there as on any day of the week one can surely find some places there where the roar of a power saw or the noise of construction machines building some new golf course can be heard, with the exception of the New Year holiday only). The short but sometimes quite unpleasant winter passed by, we learned how to prepare the imitation of our favourite dark bread from a mixture of flour and n'kka (rice bran -- containing the best of rice anyway), and with the coming of the cherry blossom time (see figure: Mirek, Dita, Zuzana, and cherry blossoms in the old Japanese capital of Kamakura south of Tokyo) we started to arrive at peace with Japan once again. We found many nice places, especially outside Tokyo. We appreciated that all the Japanese people we met were always very helpful and friendly. On our hikes we often lost our way and emerged in some mountain village where we were greeted and waved at friendly by everybody. Once we were surprised by sudden heavy rain. When seeing us hidden under a tree in a vain hope that the rain will stop soon, a driver returning to his mountain home stopped, turned his van around and without being asked for help drove us many kilometers to the Ogose railway station. We have not met a single proof that the Japanese people did not accept foreigners well, an opinion we heard quite often before. From our experience, I would say that the Japanese do accept foreigners (and somewhat differently looking foreigners at that) definitely much better than the people in my native country, Czechoslovakia. Apart from frequent earthquakes, we have never before felt so safe as during our stay in Japan. Nevertheless, it is not always easy for people of very different cultural background to come and live together. There might be hundreds of tiny cultural differences acquired during long periods of mutually isolated development of individual cultures that one has to learn to tolerate in the others, which requires a lot of patience in all participants. One small example: I think that in most European countries the children are taught from early childhood that it is impolite to make any kind of noises while eating. On the contrary, it seems that the proper way how to eat noodles in Japan is to cool them by sucking in the air together with the noodles, thus making usually a lot of noise in the process. I even got the impression from the remarks of a Japanese that it might be impolite not to make sound when eating noodles in Japan. However hard I tried to learn to eat noodles in the Japanese way, I have not been successful so far as it is usually not easy to overcome what was instilled in one's mind in childhood. My ideal of a future world would be that of people of different cultural backgrounds working side by side, or even intermixed, while keeping and tolerating their different cultural heritages. What we were most impresses about in Japan was the modesty, politeness and considerateness of the Japanese people which can serve as an example for others, too. It was a good lesson for us that people can quite well survive with much fewer means that one considers necessary in most Western countries.